Ski balance and proper lower leg alignment are just as important as a proper fitted ski boot. The combinaition of these factors will enble you to enjoy precision , proper edging and a sentional carve feeling in your turns Total Feet has invested in 2 measuring device in order to adjust as naturally as possible the skiboot to your lower leg . Ski Boot CLA is a measuring instrument that detects the shape of the shinbone by measuring the angles of the lower limbs and measuring ski boot canting. This enables ski boot canting to be adjusted without errors and objective data. By definition, a ski orthotic will improve your ski balance by speading evently your body weight on the whole length of you skiboot ( lateraly and longitudally) on the plane of your foot.Canting adjustment of the cuff would ensure most skiers of the best alignment. But some skiers with lower leg problems : knocked knees or O shaped legs would still have trouble to keep theirs skis flat .This is now available to all ski enthusiasts willing to improve their ski balance thank to canted wedges inserts specially made to fit most of high end skiboot and racing bootsThis technique has been used by skiboots racing technician for world cup racers instead of inserting wedges on the skis in order to meet the FIS ski height regulations. 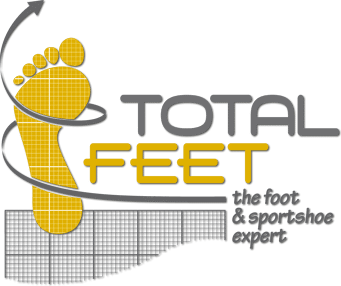 TOTAL FEET has a full asssortment of canted wedges from 0.5° to 2.5°or more, made by CANTOLOGY (USA).